All too often, I’ve seen businesses jump head-first into ERP implementation projects with no roadmap or consideration of the consequences. They’re enticed by the endless promises made by ERP vendors – instantly streamlined processes, increased profits, boosted productivity – and so they neglect to consider some crucial elements when choosing a long-term ERP platform. Implementing an ERP system successfully is a long-term project, and one which requires extensive planning and attention to detail. Over the years, I’ve helped numerous companies across Australia and New Zealand successfully implement their own ERP platforms. And from my experience, there are three crucial questions to consider to ensure you choose a long-term ERP platform that will be worth your effort and investment. We all want that one solution that will magically solve every single one of our business challenges. But even the most functional ERP won’t be any use if you don’t put in the work upfront to pinpoint exactly what you need to fix. It’s very common for businesses to outgrow their initial business management software. Or to have the platform they invested in fail to deliver against the promises that were made. Often, when this happens to businesses, instead of pausing and reviewing, they just keep adding on third party applications to make up for the functionality they don’t have but sorely need. This leads to endless manual tasks related to updating and maintaining the systems needed for the business to function – sucking up time, resources, and money. Problems also arise when companies use different software platforms for their different departments – accounting, warehousing, sales, marketing and so forth. When these different platforms don’t integrate, it creates endless issues for staff who struggle to operate with differing data across all the systems. All too often, businesses are left trying to calculate complex problems in spreadsheets because they lacked a platform that could output the reports they needed. Not only would this consume immense amounts of resources and time, it was also prone to errors, resulting in unreliable data. Whether your business is experiencing similar challenges or not – make sure you have a strong idea of what you’re trying to fix. This will help you avoid the ERP platforms that will clearly not get you there. 2. Do you and the ERP vendor have a clear implementation and change management plan that you can agree on? A long-term ERP should be easily buildable and shouldn’t be setting you back thousands of dollars for every additional feature or update. In their eagerness to fix the problems they face, businesses will jump head-on into an ERP deployment without a clear roadmap for implementation and change management. Another troubling factor, is that many ERP vendors, desperate to close the deal, will over-promise on timelines and outcomes to get the sale. Both of these tactics result in a business that is completely underwhelmed by their chosen ERP, and left with a project that is severely over budget and overdue. Without trying to do too much too fast, you and your vendor need to discuss and map out the implementation process to ensure you’re on the same page. Make sure your chosen vendor values change management. 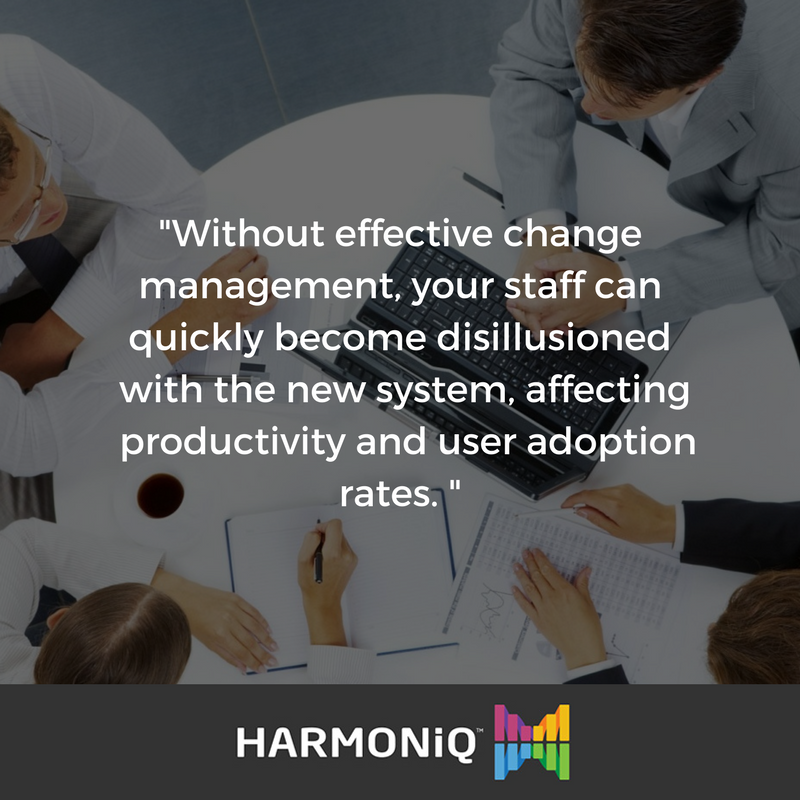 Without effective change management, your staff can quickly become disillusioned with the new system, affecting productivity and user adoption rates. With HARMONiQ, we have a comprehensive implementation roadmap. We also encourage our clients to identify their most business-critical processes – so we can work on streamlining them first. With a few ‘quick-wins’ under the belt to motivate the staff, we then move on to other parts of the business through phases. As I like to tell clients, “you don’t know what you don’t know”, so the phase-by-phase implementation approach we use at HARMONiQ systematically tackles your most crucial processes, leaves you nimble, and also helps you avoid paying for too much consultation upfront. 3. Is this platform truly a long-term ERP? Can it grow with my business? Implementing an ERP platform doesn’t come cheap. So you’d want to be sure that whichever ERP platform you choose can meet both your current and future requirements. Granted, it’s difficult to know what capabilities your business might need in 5 years, 10 years, or more. But look for an ERP platform that’s easily buildable. Many long-term ERP platforms promise to be ‘customisable’ – however their ‘customisations’ will set you back thousands of dollars in support and technical costs because they need to be custom-coded. Instead, look for a platform that doesn’t require additional application development to grow with your business. 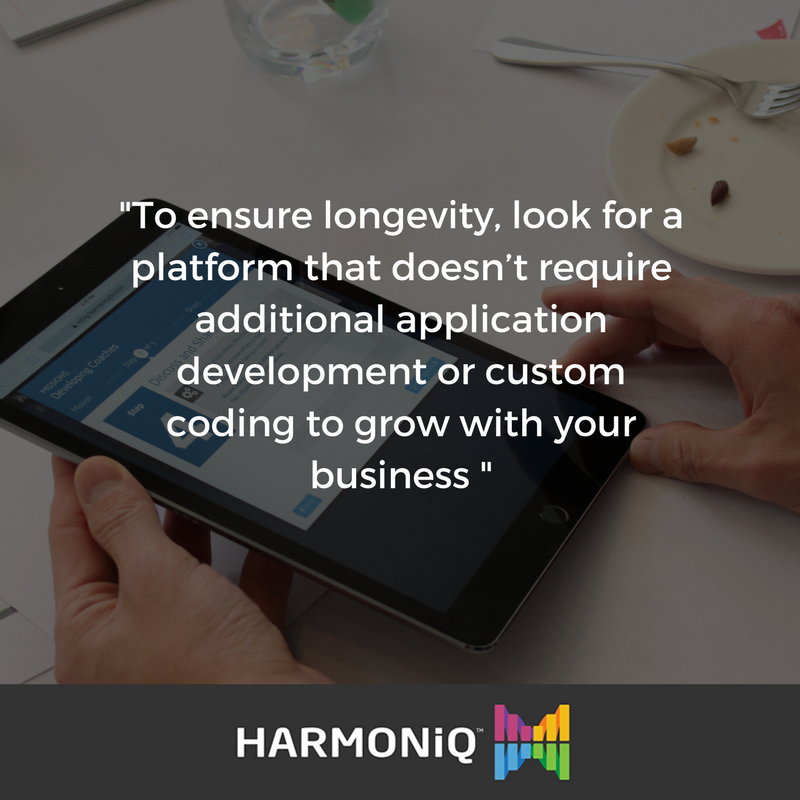 For instance, HARMONiQ can be personalised to your business needs with no coding required – giving you savings on cost, complexity, and support. I hope this blog will prove valuable on your ERP journey – whichever platform you choose. If there’s any additional guidance I can provide, please do let me know. You can reach me at drew@harmoniq.com.au. 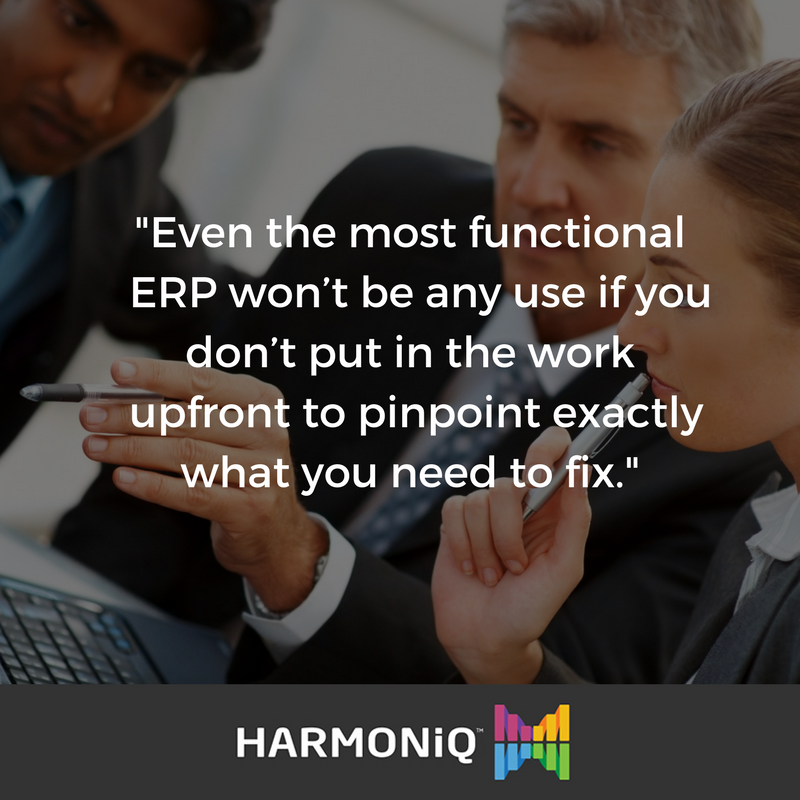 As a fully functional ERP at a mid-market price, HARMONiQ has proved to be a worthy choice for many small-to-medium businesses across Australia and New Zealand. To see if HARMONiQ is the right choice for your business, request a free demo, and we’ll take you through the key features of the platform tailored to your business needs.